APEX, the Atacama Pathfinder Experiment, is a telescope of 12 m diameter at an exceptional site on Earth: the Chajnantor plateau is located 5100 m above sea level in the Atacama desert in Chile. It was used to map the whole inner part of the plane of our Milky Way, ranging from the Southern constellations of Vela and Carina all the way to the Northern constellations of Aquila and the great Cygnus rift. 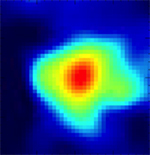 The APEX Telescope Large Area Survey of the Galaxy (ATLASGAL) mapped the Galactic Plane at a wavelength of 0.87 mm. Cold interstellar dust emits strongly in this part of the electromagnetic spectrum, called the sub-millimeter range, while it is blocking visible and infrared wavelengths. The survey has revealed an unprecedented number of cold dense clumps of gas and dust as the cradles of massive stars, thus providing a complete view of their birthplaces in the Milky Way. Based on this census, an international team of scientists led by Timea Csengeri from the Max Planck Institute for Radio Astronomy in Bonn has estimated the time scale for these nurseries to grow stars. This has been found to be a very fast process: with only 75,000 years on average it is much shorter than the corresponding time scales typically found for nurseries of lower mass stars. Now, a new paper by York University Physics & Astronomy Professor Marshall McCall, published today in the journal Monthly Notices of the Royal Astronomical Society, maps out bright galaxies within 35-million light years of the Earth, offering up an expanded picture of what lies beyond our doorstep.